It's SO BEAUTIFUL! 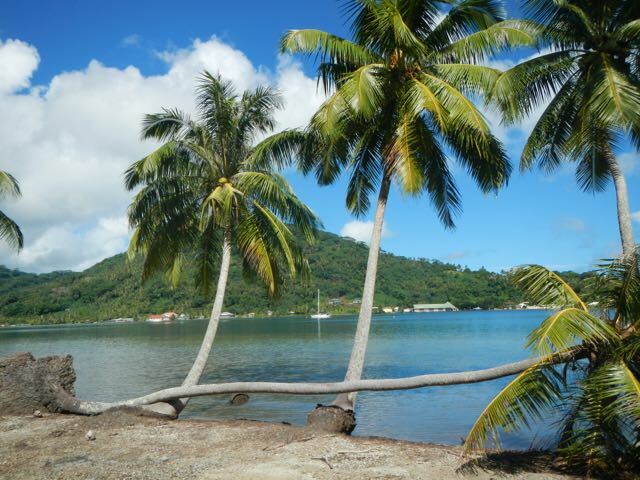 Tapuamu is on the western side of Taha'a, so facing more toward Raiatea and Bora Bora, but still it's ridiculously beautiful. 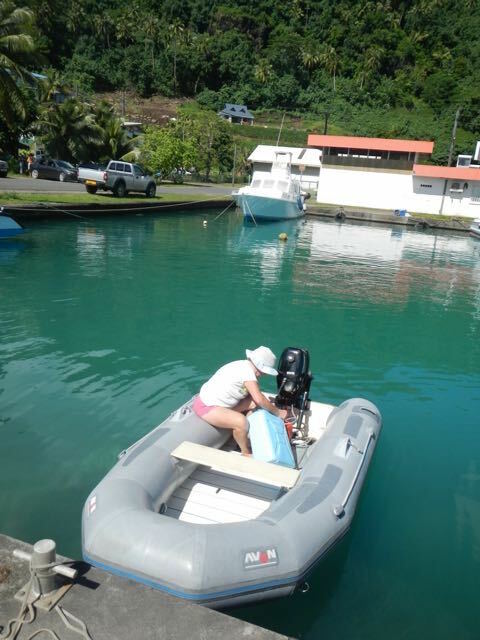 We've had the use of a mooring buoy, eliminating the need to drop our hook, and that always makes things easy for us. It was Saturday today so few businesses were open, but I think that there are few to open since the village is so small. 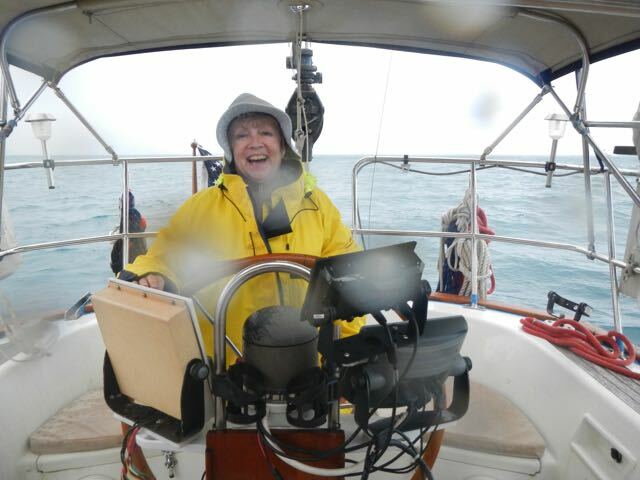 Yesterday, Conni was at the helm when the rain struck. Here she is minutes before that nasty mess behind her caught us. 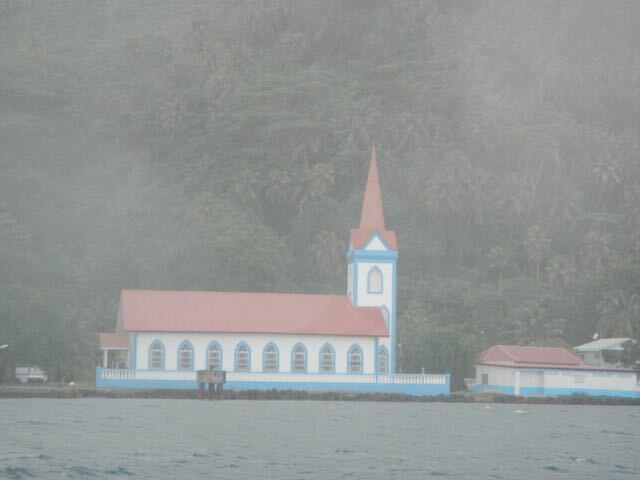 This beautiful church through the torrential downpour seems a bit "washed out", wouldn't you say? That's a HUGE church for a small island so it must draw from the entire island. I passed Conni my raincoat to wear, knowing that it would cover her from head to toe. She slipped into it and immediately burst into laughter it was so huge. 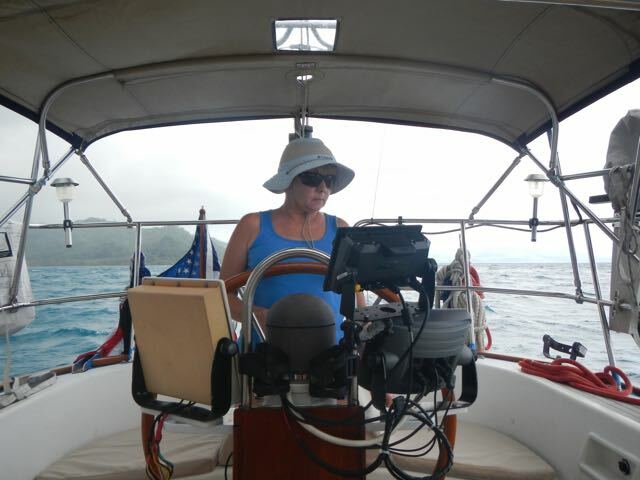 Conni is becoming quite adept at running the outboard. Here she is in Tapuamu harbor locking our empty cans. Theft doesn't seem to a a problem here, but it's a practice that we continue. This is a Conni photo of a house and car that are biodegrading in place. 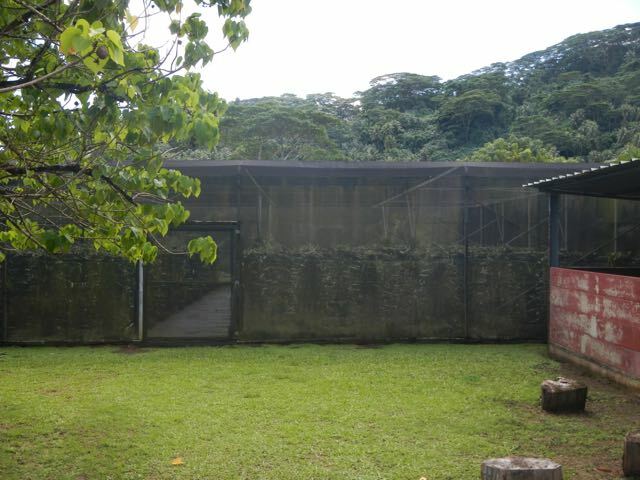 The tree is breadfruit. 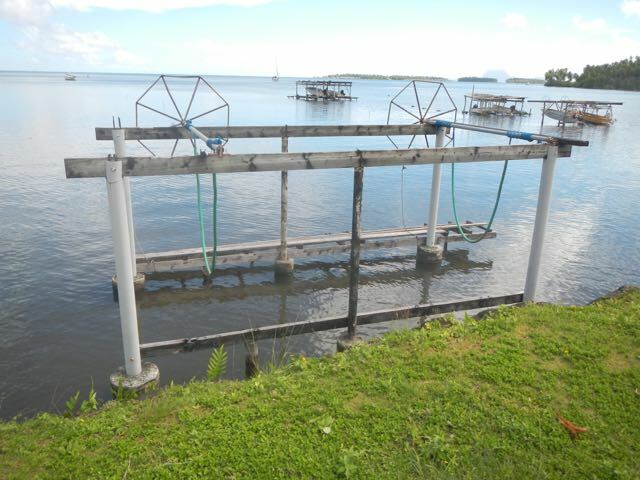 This is a great photo of the lifting system for small craft that we've seen in use here. We think that this is vanilla grown in a covered house to protect the crop from birds. It's worth the cost, no doubt. 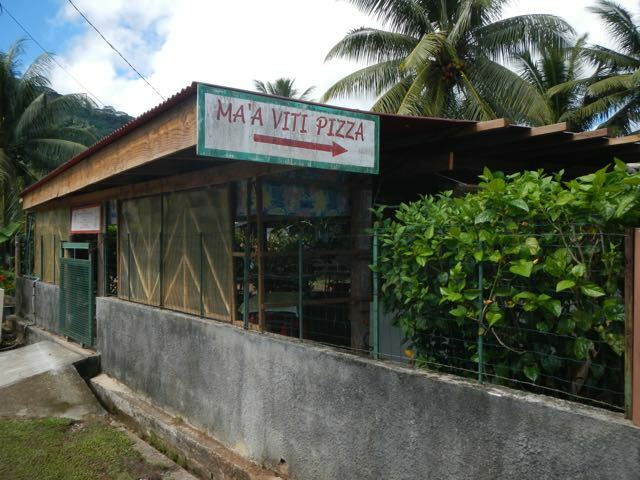 Pizza? Hot pizza? Not for lunch, but perhaps if they deliver in the bay we'll get one. 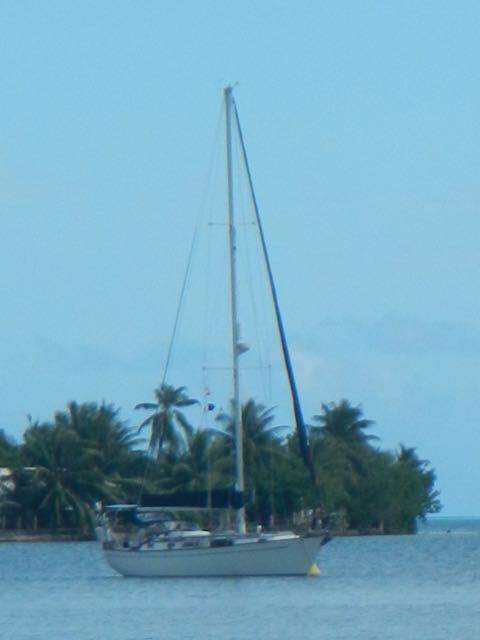 This is the offshore motu on which the luxurious bungalows are available. The lodge of which they are a part is supposedly one of the most expensive and exclusive in French Polynesia. 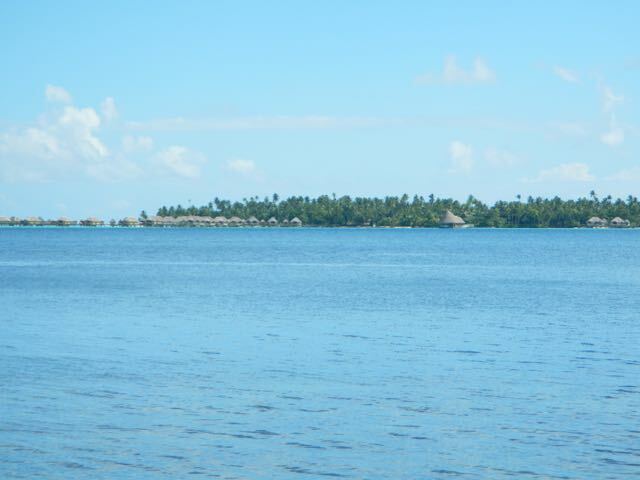 You can just discern the little over-the-water bungalows. This is copra. 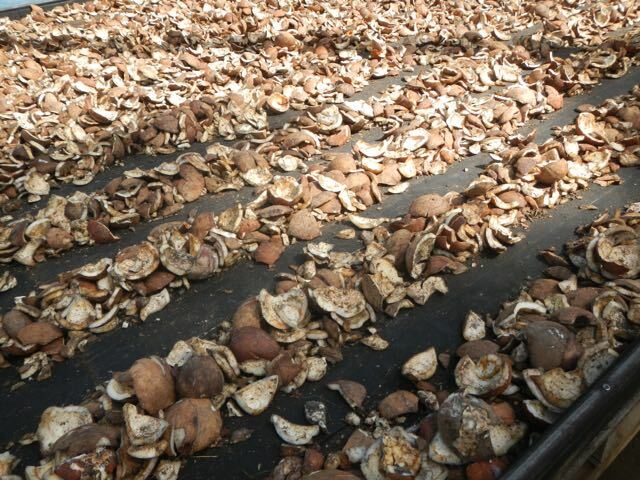 The coconut meat has been removed from the husks and is dried in the sun. It's used for cosmetics and oil, of course. 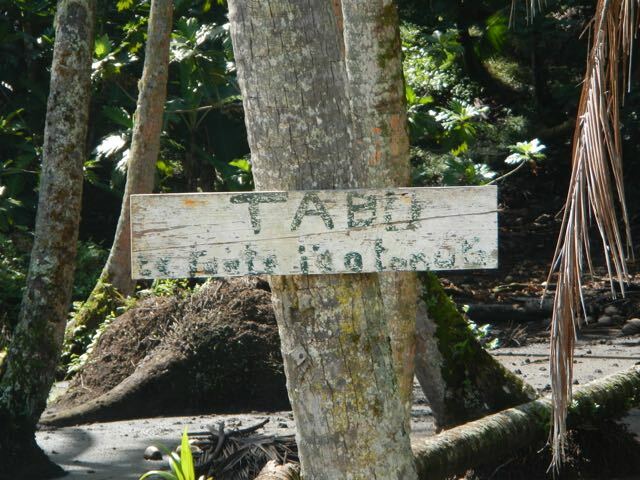 We've never seen a sign warning of a tabu, or taboo, as we spell it. We can't read the rest of the sign. 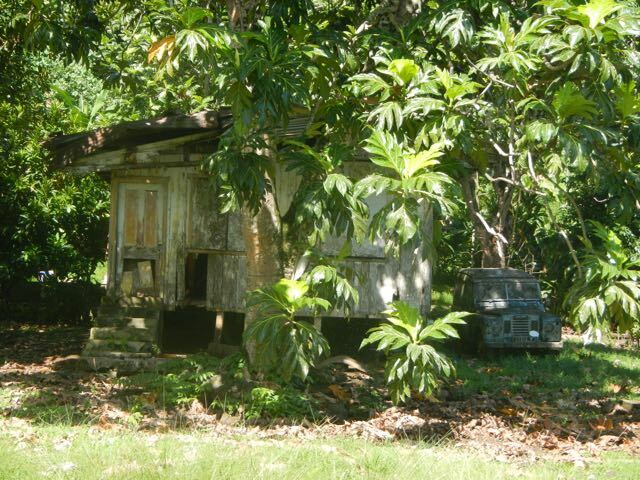 We thought that a taboo related to a semi-religious issue, but this taboo "guarded" an old copra farm bordering the road. 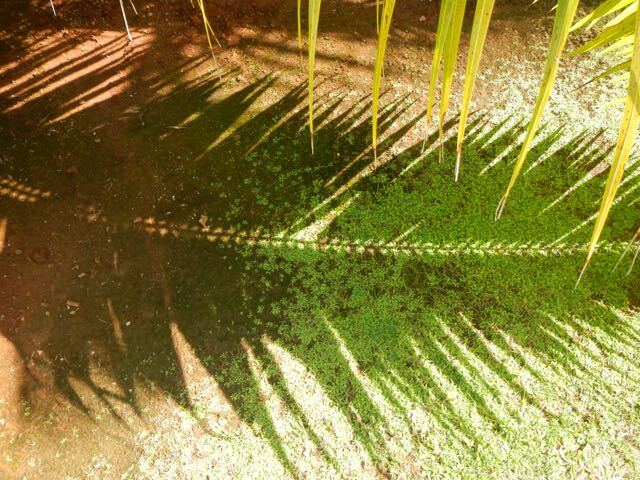 I was fascinated by the pattern of the palm shadow. Yeah, I'm a science guy, but it is beautiful, isn't it? 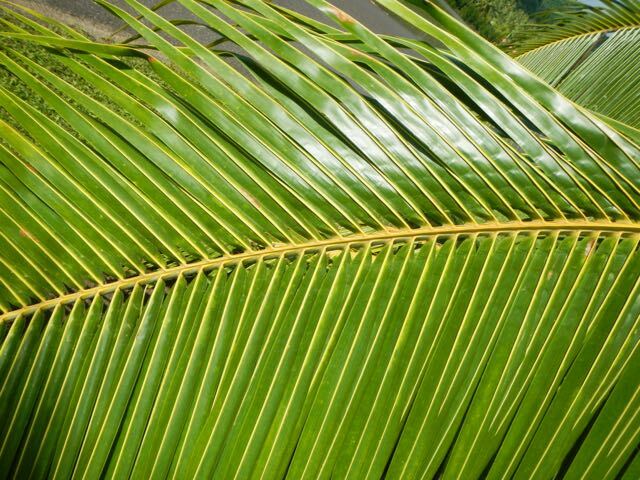 It's also obvious that the leaves are alternate rather than growing on opposite sides of the main stem. Another photo of my new favorite tree, the incredible palm. I'm sure that breaking the leaf into these pieces allows them to survive the frequent high winds. This beautiful three-master ghosted across the bay's entrance but did not stop. I think that it means that not enough happens to warrant a stopover. Good for us! 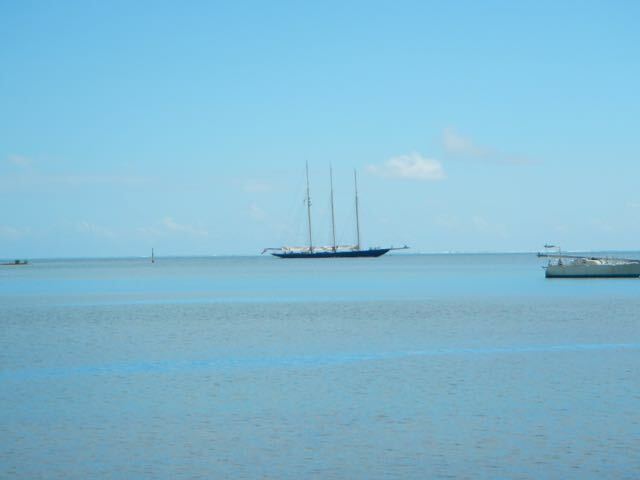 Wings in her habitat, on her mooring in Tapuamu Bay, is quite a sight.